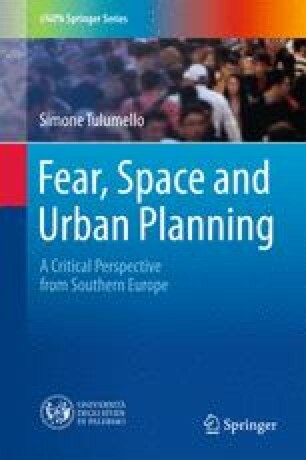 This book has two objectives: to set out a comprehensive, critical and exploratory theory of fear, space and urban planning, while unravelling the contradictions and paradoxes of their mutual relations; and to enrich recent studies about urban geopolitics and the geopolitics of fear, taking the research done from the point of view of global cities and looking at it from the perspective of ordinary cities. We shall thus use the term ‘fearscapes’, or landscapes of fear, as a linguistic trick with the aim of taking a critical approach to the spatial transformations directly/indirectly connected with, or produced by, discourses and feelings of fear. In short, the book debates whether, and to what extent, the production of landscapes of fear constitutes an (emergent) urban political economy. This chapter sets out the objectives, conceptual background and empirical context of the book. The introduction outlines the object of study, research questions and structure of the book. This will be followed by the summary of some theories about recent socio-spatial urban transformation, before focusing on the transformation in the institutional practice of urban planning, and more especially on the changing patterns of consensus building. The concept of misinformation is introduced as the main instrument for the inquiry of relations between discourses of fear and planning policymaking. In conclusion, the reasons for the election of Southern Europe as a field of study are presented, together with some notes about methodology and the empirical objects of study (the cities of Lisbon and Palermo). Fondazione Res (2014). Congiuntura RES. Osservatorio congiunturale della Fondazione RES. N. 2/2014. www.resricerche.it/media/CR/cres_10_2014.pdf. Accessed 1 June 2016.